Whether your long days are due to work, family or a myriad of other events, you need to relax at some point. With this in mind, do you have ways you go about relaxing? Not being able to unwind day after day can lead to health and other issues. So, how have you gone about relaxing after a long day? Home entertainment – If you have a home entertainment system, you have a big piece of the puzzle solved. That said you can watch movies and more in the comfort of home. For some, it almost feels like going to the movies without all the hassles. Even if you have a home entertainment setup on a smaller scale, be sure to take advantage of it. With such a setup, you can watch everything from the latest films and TV shows to rare VHS offerings. The bottom line is coming home and knowing you can entertain you or you and your family without having to go out. Family time – While it is not uncommon for some families to get on each other’s nerves, they are still your loved ones. That said rely on one another to get through those challenging times. Coming home to young children can be one of the best ways for many adults to relax. While your children may demand a lot of your time, would you have it any other way? Having a young one or two at home can help you in many different ways when looking to relax. Most of all, they can help keep you young at heart. Video games – Whether you play them on a computer or opt for TV, video games continue to be popular. With this being the case, when was the last time you indulged in a video game or two? 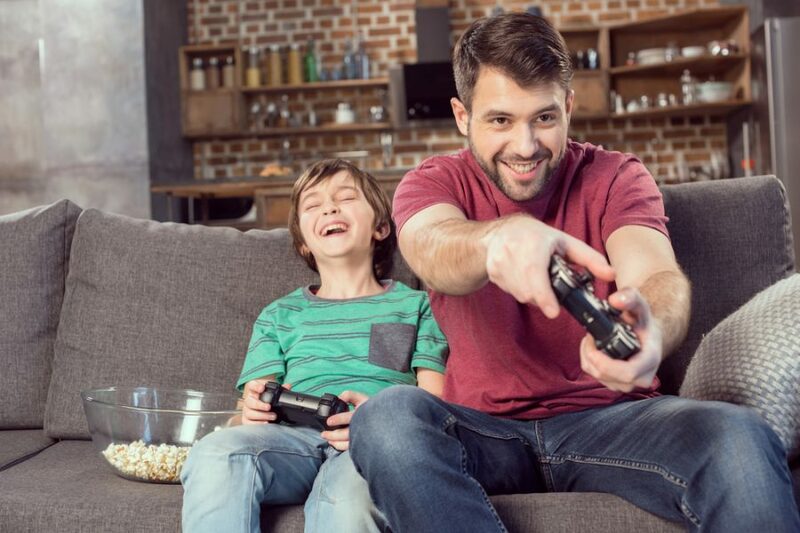 If you have young children at home, video games can be a great way to spend some quality time together. One of the cool things with video games is that many of them make the players think. As a result, you can keep your brain active and sharp. Plan a trip – Finally, if it has been a long time since you were on your last trip, what are you waiting for? Getting away from home on occasion can be rather relaxing. Yes, you have plans to make and you will spend some money more times than not. That said it takes you out of your daily routine. As such, you get a break from the workplace, family commitments and more. Start today thinking about where it is you would like to visit. You might even decide that a day trip would suffice. In doing this, you can save some money and not worry about being gone for too long when you have commitments at home. No matter where your entertainment comes from, be sure to enjoy it. By taking the time to relax and forget about all you have to do, you can stay young at heart. You can also keep your health going in the right direction more times than not.